Crown your home with the elegance of copper. European Copper Chimney Pots enhance the architecture of your home and are superior to clay chimney pots. They are lightweight and easy to install. In addition, they provide excellent rain protection, deter pests, assist in chimney draft, and serve as a spark arrestor. They are rust proof and require no maintenance. 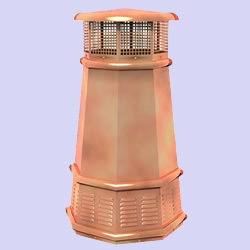 You will never find these copper chimney pots in any store. They are only available here at Hart's Hearth or from a few select chimney sweeps. If you would rather have a clay Chimney Pot, Please visit our friends at The Chimney Pot Shoppe. They carry a large selection of quality clay pots.